Despite being despised by nearly everyone who isn’t either a Liverpool fan or Uruguayan, it’s fair to say there is no-one who wouldn’t want Luis Suarez in their team. He has scored 17 goals in just 11 Premier League games. That is an unbelievable statistic but, with Suarez in the form he is now, it promises to look even more impressive as the season progresses. His first (of four!) 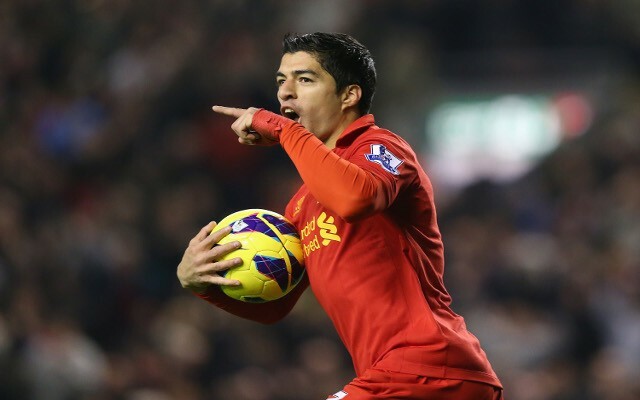 goals against Norwich was exquisite and this season Liverpool have not lost a game in which Suarez has scored. The responsibility on Suarez’ shoulders is huge but there is no way that it will stop him scoring goals for fun. Despite all the money that Manchester City have spent in the summer, Sergio Aguero is still the clubs best player and the fact he is now injured will hit the team hard, despite the wealth of superstar strikers in their ranks. Whilst he cannot boast to have the same goals-to-game ration as Suarez, Aguero has been scoring all season; the longest run of Premier League matches he has gone without scoring is three. He scored two against City’s big rivals United, two against Spurs and one against Arsenal – a wonderful volley from a corner. He is, by far, City’s most important player. Despite finding himself in the shadow of Luis Suarez at Liverpool, Daniel Sturridge is quickly becoming one of England’s most feared forwards. He started the season on fire, scoring one in all of his first four Premier League game but, with the return of Suarez, his goalscoring slowed down. He had a healthy goals-to-game ration throughout October, but injury has abruptly halted what seemed to be the start of him rekindling his early season form. It seemed a strange move when Jose Mourinho loaned Lukaku out to Everton and, eight Premier League goals later, it’s fair to say Mourinho looks very silly indeed. His best performance of the season so far came in Everton’s 3-2 win over Newcastle, where Lukaku terrorised the Newcastle defence with his power and goalscoring ability, scoring two. He netted two in the Merseyside derby and has also been in good form for his country, Belgium, scoring two in two games this season. The new Welsh wizard is having the season of his life. Ramsey is thriving with an abundance of world-class talent and his performances, which have helped Arsenal to top of the league, have certainly raised his stock. He had a fantastic September (scoring six goals in seven games for club and country) and he scored Arsenal’s winner in their historic away victory of Borussia Dortmund in the Champions League. Despite the ridiculously strong attacking talent in the Premier League, this humble lad from Cardiff is proving to be one of the best attacking midfielders around. After a low-key half season with QPR, not everyone was convinced with Loic Remy’s ability in the best league in the world, when he signed of loan for Newcastle in August. He has proved a great deal of people wrong though, scoring eight Premier League goals in 14 appearances, including two against Hull, two against Cardiff and one against both Chelsea and Spurs. He also had a very good game against Manchester United, which begs the question – are there any doubters left? In my opinion, the best player of the season so far. His goalscoring record doesn’t stand up to Suarez’s but the fact his team are under pressure and languishing in mid-table puts further emphasis on his incredible performances. Despite speculation about his future in the summer, Rooney has put in a run of sparkling performances for Manchester United; he ran the show against Chelsea and has saved his team on more than one occasion (for example, against Spurs when he netted twice to earn the Red Devils a draw). Cynics may argue his great performances are to try and stimulate interest in January, but in the meantime Rooney is inspiring Manchester United. Yaya Toure has been one of Manchester City’s most important players so far this season. The ex-Barcelona midfielder has perfected his free-kick technique and has scored a few goals from set-plays, including penalties, but in open play he is a monstrously imposing figure. With Aguero and Negredo banging in the goals, part of Toure’s role is to control the midfield and he has done it to perfection so far this season, as well as being a threat going forward. Previous articleIs time running out for AVB?